Summary: A decent start corrects some problems from this spin-off’s parent show, while simultaneously creating new ones. Years ago, Alice returns home from an adventure in Wonderland as a little girl. Her father, however, is horrified about her disappearance and stories. In the present day (Victorian England for Alice), she still believes in Wonderland, and has been placed in an asylum as a result. In flashback, we learn that Alice returned to Wonderland as a young adult to prove she was telling the truth, met a genie named Cyrus, and they fell in love. However, after Cyrus proposed to Alice, the Red Queen arrived, attacked, and threw Cyrus off a cliff. In the present, Alice is still broken up about the loss of Cyrus internally, but has started to believe that she did imagine Wonderland. That is, until Will the Knave of Hearts and the White Rabbit arrive to rescue her from the asylum and bring her back to Wonderland. Will, it seems, was in Storybrooke, and after hearing from the White Rabbit that Cyrus was alive, he came to bring Alice to Wonderland to find him. The White Rabbit, however, was overexaggerating about Cyrus being alive–it was a rumor he heard from the Doormouse. In fact, the White Rabbit was doing the Red Queen’s bidding, bringing Alice back to Wonderland. She is working with Jafar, it seems, and he is interested in taking Alice out. Alice and Will venture to the Mad Hatter’s abandoned house, where they find Cyrus’s amulet, which Alice believes means he must be alive. We learn that Cyrus was rescued by Jafar in the fall, and is now being held captive. This is quite the interesting endeavor. 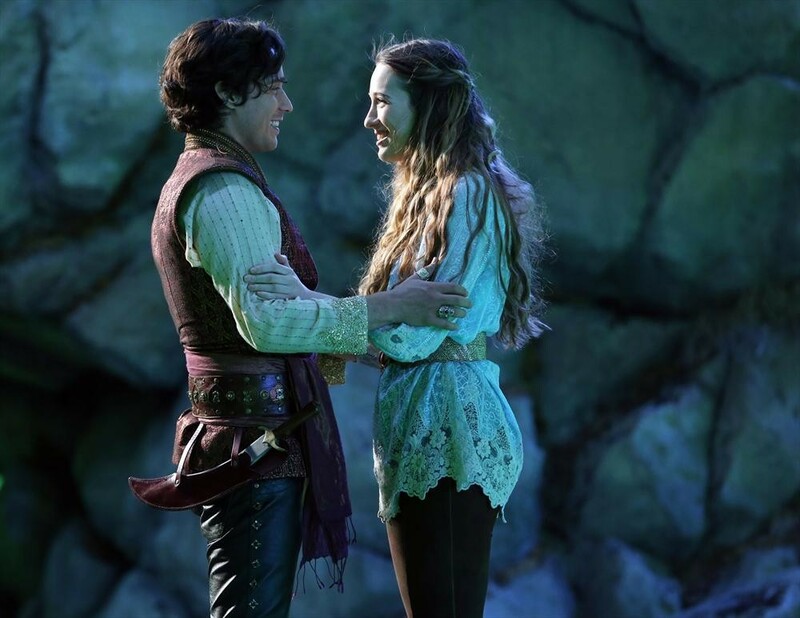 For a show in such a big world, Once Upon a Time seemed increasingly like it was running out of ideas last season. While the first couple of episodes this season have felt much more focused, it’s still weird to think that there would be enough material to craft a spin-off so entirely disconnected from the parent show. But while Wonderland is no where near the most perfect pilot of the season, it’s surprisingly successful given its context. There’s a solid balance stricken between how reliant it is on its parent show versus how disconnected it is; it trusts that we’ll already be familiar with the multiple worlds and fairy tale world concept, but strays far from the whimsical tone and lighter structure in favor of a darker, moodier and more tightly focused endeavor. The original series really only worked if you could accept the silliness of it all for the sake of character-centric stories, but Wonderland attempts to skirt past that by being less child-like fantasy and more imaginatively weird. Of course, this being Wonderland, that concept fits perfectly. Comparisons to the parent show aside, Wonderland more or less delivers exactly what we expect, which is both a plus and a problem. On one hand, Wonderland doesn’t feel like it’s trying too hard to differentiate itself from the hundreds of Alice in Wonderland incarnations out there (a problem I’ve had with many recent Alice tales, especially Tim Burton’s film.) In fact, it unabashedly presents this as the same story with the same darker “maybe Alice is crazy” twists on it that we’ve seen time and time again, just as the background. It’s not surprising to see Alice in the asylum because that gothic horror story has been done, but it’s refreshing to see her get past all that drama so quickly. A different story is being told, and the insertion of Jafar and a genie for the heck of it allows this to all be seen in the larger context, but it isn’t trying to subvert any of it. It embraces the classic story and its adaptations, uses them as background, and then tells a natural story with that in mind. The downside is that the plot itself is very standard, with few surprises and mysteries that are terribly engaging. Jafar rescuing Cyrus on the magic carpet, for example, was not nearly the “gasp!” moment the music and presentation tried to play it up as. We’ve got lots of backstory to explore, presumably, but as of yet it feels like more of the same revenge stories and whatnot. That said, the world and the characters are what “Down the Rabbit Hole” smartly chooses to focus on, and that makes the episode engaging in spite of a fairly bland plot. It’s helped that the cast settles into their roles nicely, with Sophie Lowe competently taking on the role of a headstrong Alice while still carrying the childhood charm necessary for the role. Even though her story is solely driven by finding her lover, there’s potential to round her out as a complex character outside of the love story, hopefully. The idea that she was, even if only for a short time, convinced that Wonderland was imaginary shows promise that the events could wear on her psyche, and thus provide ample internal drama. It’s also impressive how well the expedited love story between Alice and Cyrus played out, thanks in part to a heaping amount of chemistry, but also because Alice doesn’t seem falsely enamored. Despite Alice’s youth, Lowe carries a sense of maturity that helps us trust her decisions, even those as contrived as the “love at first sight” moment. Then again, this is a fantasy world, so quick love stories are on par with the territory. The standout of the hour is Michael Socha as Will, the Knave of Hearts, whose misfit rebel attitude provides some flair to the otherwise straight-laced cast. His backstory also holds the most potential, if for nothing else than that it seems like it will stand apart from the main love plot. The “ragtag team” of Alice, Will and the potentially traitorous White Rabbit is a fun idea, and the two actors and their animated counterpart (voiced with welcome seriousness by John Lithgow) work well together. Emma Rigby as the Red Queen is the weakest of the cast thus far, a little stiff as she essentially plays the “spoiled arrogant ruler” archetype we’ve already seen countless times. But to be fair, “Down the Rabbit Hole” only gives her a minimal amount of material to work with. The same could be said for Peter Gadiot as Cyrus, who brings the slightest bit of charisma, but still feels rather bland in an equally bland role. Again, he doesn’t have as much to work with aside from being a man Alice can swoon over, but for being a genie, a little more flash would be expected. Naveen Andrews, on the other hand, is an inspired casting choice as Jafar. There’s nothing unexpected about his version of the Aladdin villain, but Andrews utterly hams up his performance in the best way. As odd as it may be to factor in the Aladdin mythos so heavily in this spin-off, the sheer delight of seeing Andrews–who looks, dare I say, gorgeous in his elaborate garb–is worth it, as is that perfect snake staff and magic carpet. One thing that is a little confusing, which shines a light on a problem established at the end of season 2 of Once, is the nature of parallel worlds outside of the major fantasy worlds. The idea that a storybook world where all the whimsical fairy tales happened makes sense, but it’s become a bit muddled with the addition of these alternate time travel-y fantasy worlds, which are essentially our world in an earlier time period but without the stories we know them from (…right?) It’s not entirely noticeable in the early parts of the episode, actually, until we also have Will mentioning things from Storybrooke in “our world” (the cute s’mores exchange) that Alice, of course, doesn’t recognize. The show doesn’t seem to touch on it at all (unless it will eventually) and just assumes we’ll accept it in favor of the story. It’s probably for the best, but it also muddles a story that doesn’t need to be convoluted. The biggest problem with the episode is the effects, though it’s easier to get past than would be expected. It’s certainly admirable for a show to be so unafraid to to be big, even if it’s biting off more than it can chew. And to be honest, the characters like the White Rabbit, Chesire Cat and Caterpillar, while certainly very animated looking in that glossy kind of way, don’t look too much worse than recent big budget film adaptations. The context of Wonderland being a dreamy, cartoonish world in concept helps this, so the characters not looking quite real honestly fits, and thus it’s easier to get past. The detail of it all is admirable, too, like the White Rabbit’s facial expressions, and the moderately creepy pink eyes. Individual effects are fun, like the well-handled shrinking effect for Alice towards the beginning. The landscapes, on the other hand, are very hit-or-miss; the opening bits of the episode aren’t terrible, but the final crane shot looks laughably unfinished and pieced together. Again, it’s very cool to see a show power through budget issues to tell the story they want to tell, but it would be better to keep the extravagant scenery to scenes where other stuff is going on. If a shot is simply to show off the landscape, we’re going to notice if the landscape doesn’t look that great. Where the show fails at the fantastical landscapes, it’s surprisingly competent in its action, with multiple well-choreographed fight sequences. It stands way above and beyond its parents show in this respect; the former often relies too much on magical effects, while this is more down-to-Earth with its fighting…as down to Earth as a show about Wonderland can be, at least. It’s funny that this works so well, as the weird amount of fighting and action in Tim Burton’s Alice film was a point of contention (and I, personally, didn’t like it at all.) Mark Isham’s score for Wonderland is also effective, a significant improvement from its parent show. There’s better use of the “music box” motif, and usually it’s used for a far creepier effect. The creepy piano at the asylum was a standout, for example–and rightfully so, considering it’s pretty evident Alice was going to get a lobotomy. The cheese factor is downplayed overall, and elements like bagpipes are added in to make it feel significantly different. That said, the Red Queen’s “angry music box” theme is kind of lame. There’s plenty of promise in Once Upon a Time in Wonderland, thanks in part to it handling its status as a spin-off with maximum competency. With an already established backdrop, the show has managed to jump right into a character-centric story, free from many of the plot hang-ups the original Once was forced to deal with. As such, Wonderland has the capability to tell a smaller, focused story rather than unraveling world-shaking mysteries, akin to a season-long version of Once season 1’s character episodes. Since Once doesn’t do that much anymore, Wonderland ought to be a neat way to explore characters who deserve a little more attention. Even without the connection, though, it stands alone as an engaging adventure. While it won’t blow our minds, it functions as a nice escape with at least a semblance of deeper emotional context. There’s plenty of mystery left to explore, and we aren’t expected to overlook too much silliness for the sake of a good story. Considering how silly all of this could have turned out, and especially how silly we’ve seen Once get, that’s quite a feat. The cameos from Leroy/Grumpy (Lee Arenberg) and Ashley/Cinderella (Jessy Schram) was fun and not overindulgent, especially considering Cinderella hasn’t been seen in the Once universe in quite a while now. I’m fully expecting the wishes Alice carries and uses to bribe the Knave to become a huge plot point down the line. That the White Rabbit’s ability to create portals is referred to as “digging holes” is cute. With Scandal on at 10pm, we now have two shows on one network on one night with a character named Cyrus. Because that’s a popular name now, I guess?